A workhouse or poorhouse is a publicly maintained facility for the support and housing of poor persons, typically run by a local government entity such as a county or municipality. Institutions of this nature were founded in seventeenth-century England and were also widespread in the United States in the nineteenth century. The Poor Laws of seventeenth-century Britain assigned the care of the poor to church parishes, and this proved unworkable when the numbers of those in need rapidly increased and social attitudes towards the poor changed from sympathy to intolerance. Later laws, in particular the 1834 Poor Law, organized the parishes into Unions who became responsible for running the workhouses. At this time strict controls were enforced regarding who was eligible to enter the workhouses and the conditions under which they operated. In order to make them unattractive, so as to ensure no abuse of this charity, workhouse conditions were deliberately harsh, often no better than a prison. Although some directors and staff were well-meaning, often they were ill-qualified and incompetent, with the result that the inmates suffered greatly. By late nineteenth century, the numbers of able-bodied inmates were greatly reduced, those remaining being those in greatest need—the elderly, the sick, and orphaned children. By the mid-twentieth century, with the development of a comprehensive system of social services and the welfare state in the United Kingdom, and the Social Security Act in 1935 in the United States, workhouses no longer existed; the institutions that remained specialized in the care of each group separately, including accommodations such as shelters specifically for the homeless. Yet the problem of poverty remains. Its solution involves more than state-run programs; it requires a change in the hearts and minds of people to care for each other as one family. 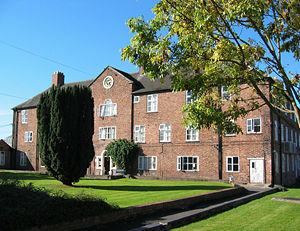 Former workhouse at Nantwich, dating from 1780. The first record of the word workhouse has been dated back to 1631 in a report by the mayor of Abingdon, England in which he established “a workhouse to set poor people to work.” In British history, a workhouse was a place where people who were unable to support themselves could go to live and work. Though the 1601 Elizabethan Poor Law made no mention of workhouses, the act did state that “materials should be bought to provide work for the unemployed able-bodied." The act also proposed the building of housing for the impotent poor, which included the elderly and chronically sick. An act following the end of Queen Elizabeth’s reign, known as the Act for the Relief of the Poor, held parishes legally responsible for the poor. The act was funded by a poor-rate tax paid by local property owners. The majority of poor relief during this time took the form of charitable grants, clothing, or food. The workhouse system began to evolve in the seventeenth century as a way for parishes to decrease the amount of poor-rate taxes. The 1723 passing of the Workhouse Test Act made it possible for parishes to offer workhouse employment in return for board and lodging in place of charitable grants. In 1782, the passing of Gilbert’s Union Act simplified the procedure for parishes to establish workhouses by allowing a group of parishes to form a Gilbert Union. This act allowed for able-bodied poor to be exempt from workhouses until sufficient work could be found for them. In the early nineteenth century, the general social conception of poverty transformed from a sympathetic viewpoint toward one of intolerance. Poverty became largely viewed as the result of fecklessness, immorality, idleness, and drunkenness. Many believed too liberal a welfare regime would merely encourage these vices and discourage self-improvement and honest labor. With the Industrial Revolution, a growing population, and the move toward urbanization, English society faced increasing levels of poverty that the former parish system was unable to cope with. In response, the 1834 Poor Law Amendment Act was passed which organized the 15,000 or so parishes in England into Poor Law Unions. Each union was managed by a Board of Guardians and administered by a Poor Law Commission who looked after a mixed workhouse of varying ages and abilities. New buildings were designed to separate the inmates into certain categories. Under such a program, poor relief would only be granted to those willing to enter the bleak conditions of a workhouse. If an able-bodied man wished to enter the workhouse, his entire family was forced to enter with him. In the 1830s, workhouse conditions were deliberately harsh to deter the able-bodied idle poor from relying on them. Men and women were segregated and children were separated from their parents. Aged pauper couples who, by definition were neither idle nor criminal, were not allowed to share a bedroom. By entering a workhouse, paupers were held to have forfeited responsibility for their children. Education was provided but pauper children were often forcibly apprenticed without the permission or knowledge of their parents. This may well have been done for the best motives but was desperately cruel nonetheless. Inmates surrendered their own clothes and wore a distinctive uniform. There were many well-meaning measures such as education for children and the provision of doctors and chaplains. However most workhouses were run on a shoestring and these philanthropic gestures often fell far short. In many ways the treatment in a workhouse was little different from that in a prison, leaving many inmates feeling that they were being punished for the crime of poverty. Some workhouse masters embezzled the money intended for blankets, food, and other important items for their own personal use. Visitors reported rooms full of sick or elderly inmates with threadbare blankets and the windows wide open to the freezing weather. The workhouse system was the mainstay of poor relief through the Victorian era. Overall they were places of dread to the laboring and indigent poor. Reformers like Charles Booth and Seebohm Rowntree revealed that there was widespread poverty in Victorian England and that the workhouse system was not helping. Books such as Charles Dickens' Oliver Twist highlighted such abuse. The meals supplied in the workhouse had to meet the condition of less eligibility, a principle stemming from the Poor Law Amendment Act of 1834. The principle enforced workhouse conditions to be extremely harsh in order to deter the impoverished from taking advantage of the workhouse system. Conditions were callous, and while adequate, the food was boring and of poor quality. Until 1842 all meals were eaten in silence and in the 1830s some workhouses did not allow cutlery, completing the humiliation. Breakfast in a workhouse usually consisted of bread and gruel. Dinner often consisted of a poor quality vegetable soup. For supper a workhouse member could expect bread and cheese. Due to this poor diet the members of a workhouse often suffered from malnutrition. In the 1850s the then vicar of Stoughton and Racton in West Sussex wrote to the Guardians of the Westbourne Workhouse requesting that, as a matter of Christian charity, second helpings of gruel were provided on Christmas Day. He was informed in no uncertain terms that if the rations were raised above the minimum required to keep body and soul together the result would be laziness, fecklessness, and hordes of otherwise able-bodied people clamoring to be received. The workhouse master could implement rules in order to create a system of rewards and punishments which aimed to instill discipline within the inmates. For breaking rules paupers could be punished with any type of specific punishments set out by the Poor Law Commission. Examples included beatings, confinement cells, and reductions in rations. Work was provided to keep the inmates busy, though it was usually boring, hard, and degrading. Examples included crushing bones, stone breaking, and picking oakum. Cooking and cleaning in the workhouse kept many busy. In 1846 the notorious Andover scandal revealed a shocking state of affairs at the Hampshire workhouse. The Master, ex-sergeant major Colin M'Dougal, ran a reign of terror. Starving paupers were reduced to sucking the marrow from the bones intended to be ground for fertilizer. In the mid-1850s, workhouse infirmaries showed slight improvements. In 1854 the superior facilities offered by the Wakefield workhouse led to the closure of the local hospital. In 1865, Florence Nightingale dispatched Agnes Jones and twelve nurses to improve the Liverpool Workhouse. Many of the former nurses were fired and various improvements were instituted. By 1900 many people were voluntarily entering workhouse infirmaries, drawn by the better standards of care. Though workhouse conditions would improve as the nineteenth century wore on, only a few lived up to the high-minded ideals of the founding systems. In order to save money, the Poor Law Commissioners paid the staff abominably low salaries. Though the Governor of a Victorian prison received £600 per annum, a workhouse master running a similarly sized organization received on average £80 per annum. Inevitably, workhouse service often attracted ill-qualified, brutal, and incompetent directors. Workhouse masterships often attracted rootless ex-army officers with little experience of running large institutions. Master George Catch, an ex-policeman, ran a regime of corruption, tyranny, and murder throughout several workhouses until eventually committing suicide. Workhouse chaplains and doctors were paid less than half of what they could expect anywhere else. Medical officers had to pay for the drugs they supplied and the commonplace practice of employing illiterate paupers as nurses led to significant problems. However, workhouse teachers represented a particular problem. Workhouse guardians were keen to educate pauper children for the very good reason that if they could read and write they were less likely to return to the workhouse as adults. In Salisbury, Coventry, and Deptford it was revealed that the appointed teacher, often one of the paupers, was in fact illiterate. Prior to Forster's Education Act of 1870 poor children received no education at all. As economic conditions improved throughout the nineteenth century, workhouses took in very few of the able-bodied poor. By the late nineteenth century, the overwhelming bulk of workhouse inmates were the elderly, orphaned, or abandoned children, deserted wives, and the mentally or physically ill. Without need to deter these unfortunate people by harsh conditions, there proved some structural improvement. Despite harsh conditions, poor workhouse education and medical facilities marked an improvement on what was offered elsewhere to the poor population. Though the majority of workhouse horrors can be traced back to the first half of the nineteenth century, some workhouses proved models of efficiency and compassion. At Ashford workhouse many paupers wept at the retirement of their master, an ex-naval officer. In the mid-nineteenth century, the United States developed an idea similar to the workhouse, termed a Poor Farm. At this time in America, poverty was viewed as a dishonoring, guilty state, justifying a rather uncharitable treatment resembling a reformatory or forced penal labor. On poor farms, poor populations could be put to hard, manual labor and were often subject to physical punishment. Poor farms were county-run, and supported a significant number of paupers, elderly, and disabled people at public expense. Often, a poorhouse was situated on the grounds of a poor farm on which able-bodied residents were required to work. Most poor farms were working farms that produced at least some of the produce, grain, or livestock that they consumed. Residents were expected to provide labor to the extent that their health would allow, both in the fields and in housekeeping or care for other residents. Rules were strict and accommodations minimal. At the end of the nineteenth century, conditions in workhouses gradually began to improve. During this period, most residents of workhouses consisted of the elderly, the sick, and orphaned children. Resident diets improved, becoming better with more variation, and daily tasks became less strained. Often, orphaned children were sent from the workhouse to special schools or countryside cottages. By 1930 most workhouses had become extinct, with the majority of the buildings sold off or demolished. Few facilities became Public Assistant Institutions, providing accommodation for the disabled, elderly, chronically sick, and homeless. The use of poorhouses and poor farms in the United States significantly declined after the passage of the Social Security Act in 1935. By 1950 most poor farm institutions had disappeared. ↑ 1.0 1.1 The Workhouse Retrieved February 16, 2008. This page was last modified on 3 August 2013, at 16:51.